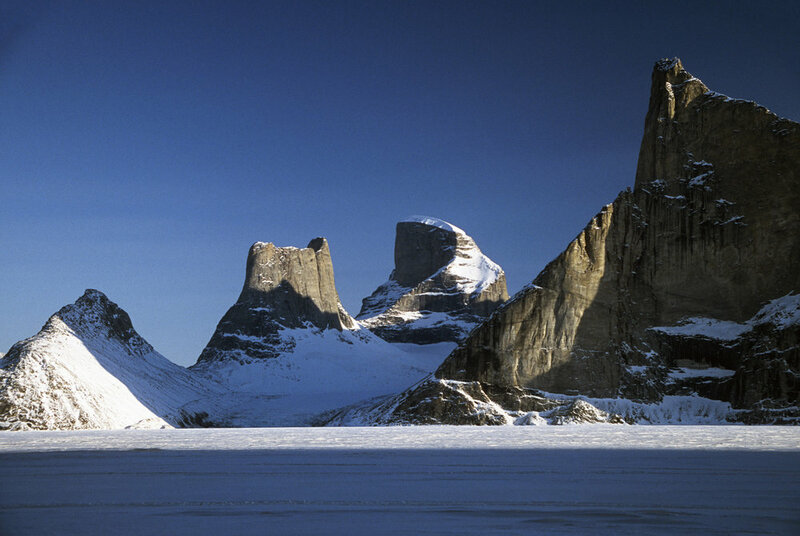 Sam Ford Fjord is an isolated and L shaped Arctic fjord, which is located on the Northeastern coast of the Baffin Island in the Arctic Archipelago, in the Qikiqtaaluk Region of Canada. The fjord stretches for approximately one hundred and ten kilometers and was traditionally one of the hunting areas of the Inuit, popularly known for its spectacular granite cliffs (some of them are the highest cliffs in the world) which rise high from the shores. We decided to explore it on Skis. 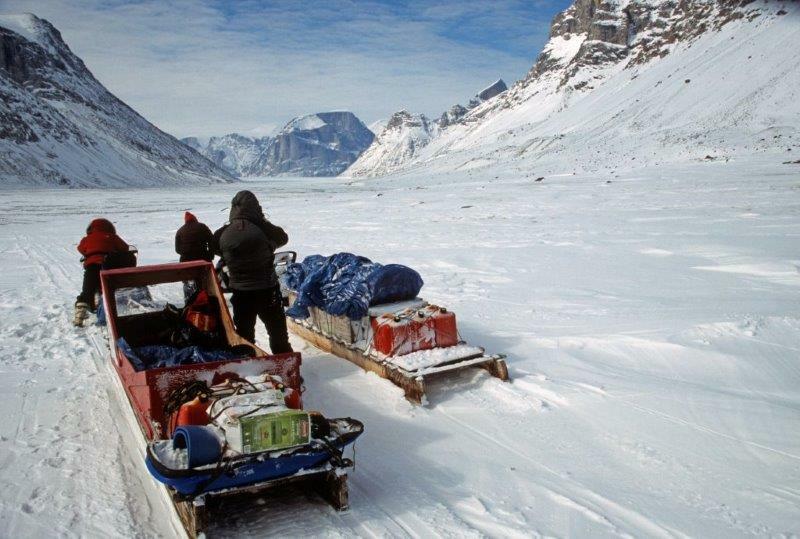 The expedition to Bylot Island in the Canadian Arctic was undertaken by Derek, David (our Brit Extraordinaire), and Dave, who lives and works in the Inuit village of Pond Inlet, on the NE coast of Baffin Island. Dave Reid was the last Scot ever to the recruited by the Hudson Bay Company, in the late -1980s; now he is the local “Mr. Fix it” for expeditions, research projects and the like. Pond Inlet (“Pond”) is accessible via the scheduled air service of the Inuit-owned airline, First Air, 2.5 hours flying from Iqaluit, or 4 hours with a stop in Clyde River. David and I met in Ottawa and flew up to Iqaluit from there. Pond is a village of some 1,500 people. It is a relatively new place, founded in the 1920s, and has only significantly expanded since 1970s when previously nomadic families settled there permanently. There is a big government presence, a dirt airstrip and a developing iron-ore mine to the south: all these provide some employment, but otherwise the population still survives on hunting (polar bear, seal, narwhal, geese) and inevitably, on government handouts. Directly from the airstrip we could see the wall of snowcapped mountains on Bylot Island, 20 miles away across Eclipse Sound. They rise straight out of the sea up to more than 6,000 feet. We had planned to go over to the island immediately, but our plan was thwarted by the rough sea and the time taken to deal with Parks Canada bureaucracy. 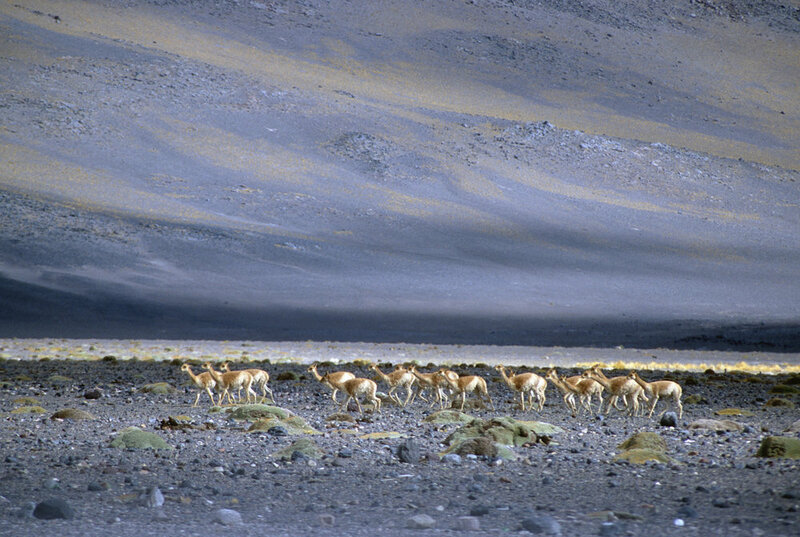 In fact, the orientation session was run by one of the wardens, Israel, whom we had met two years before on Ellesmere Island. He recognized us straight away! Pond is his home, and he is clearly delighted to be back here with his family, instead of being posted to the remote Tanquary Fjord station on Ellesmere. Orientation is mandatory and it is supposed to educate visitor on sound environmental practice, how to deal with polar bears etc. We have heard it all before, and the Park’s staff merely shows videos and read from a prepared script. It is a bit like a safety briefing on an aircraft. 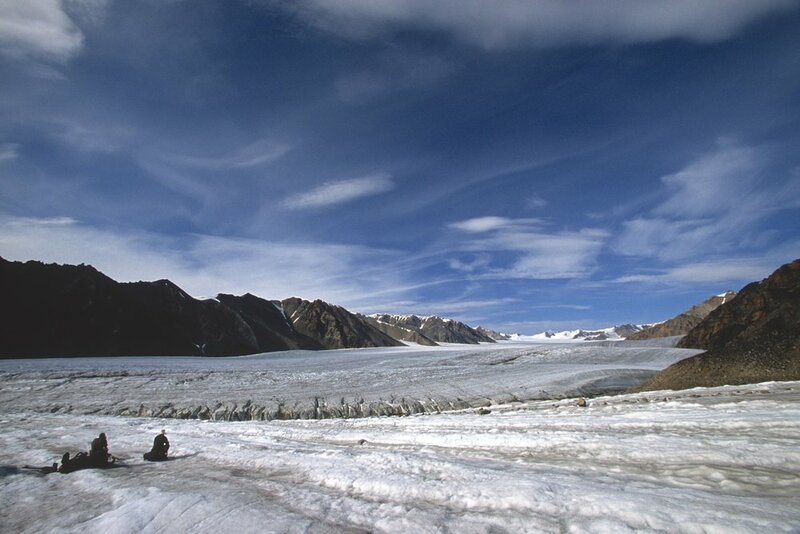 Bylot Island is part of Sirmilik National Park, the fourth largest in Canada, but one of the least visited. It was created only in 2001. Simirlik means “place of glaciers” in Inuktitut, and indeed the island is characterized by a large number of glaciers originating from an ice cap in the central region. The island is 50 miles N to S and 100 miles E to W. It is uninhabited: during our trip we were the only people on the island apart from two bird researchers camped on the western side. Much of the island has never been explored. The N to S crossing by Tillman in August 1963 is perhaps the well known; it is recounted in his book Mostly Mischief. Otherwise visitors have tended to gravitate toward specific areas: the climbing interest is in the 3 highest peaks, Thule (1,711m), Angilaaq and Mitima, which are to the west side of the Sermilik Glacier. This is one of the biggest glaciers, which reaches the sea directly opposite Pond. The bird researchers gravitate toward the west coast of the island. The entire island is a designated bird sanctuary. It is the northern end of the migration route of the greater snow goose with more than 250,000 birds on the island in the summer. The particular hazard for us was the polar bear. There are 150 of them in the island. They are commonly seen on the beaches but more on the north side of the island than on the south. We planned not to spend very much time on the beaches for that reason. We were armed only with bangers and flares as it is prohibited to carry a firearm in the National Park. We were fortunate to have seen only paw prints in the sand. During our enforced stay in Pond that first day, we made two critical decisions. One was to split the trip into two parts, leave half the food and some spare gear on the beach in bear proof barrels, and therefore reduce our load somewhat. The second decision was to take only one tent and squeeze the three of us into it, again saving weight. The North Face Mountain 25 is after all designated as a 3men tent J! We could see the immediate pros of these decisions. The cons were only apparent later. Next morning we were able to leave at about 10am in the small boat owned by local hunter Sheatie Tagak. The 20-mile ride across the sound was $500. We were kitted out in orange survival suits. The sea was glassy calm and we had a fast ride across the sound in just 45 minutes, to a point just east of the toe of the massive Sermilik glacier. On the way across the sound, we passed by huge icebergs that originate from Greenland or Ellesmere Island and are swept into and around Eclipse Sound by the current. On the beach we sorted our heavy packs and were off. Despite our weight saving measures, our packs still weighted in at around 40lbs. The crampons, ice axes and other mountaineering gear count for a lot of that. We were over the moraine and on the glacier within an hour. All the snow having melted we could walk easily on the ice without crampons, any crevasses being obvious and easily negotiated. After lunch we turned further west onto a side glacier, big enough in itself, and crossed over to the west side where we camped on the ice at the foot of a steep incline. The following day we headed further up the glacier in a northerly direction. An interesting peak appeared to our right, and we resolved to seek out routes to the top. Camping beneath its south-west spur, with excellent views down the glacier all the way to the sea, we walked further to the north and up the scree on the north side, but this rock band was simply too steep and too loose to be a viable option. On the third day, in bright sunshine, we looped back south and then west into a huge bowl of snow and ice that gave us easy access into the southwest ridge, with just a short section of ice where crampons were required. On top of the ridge the ice gave way to more rock – all of it loose – but we could scramble up the ridge quite easily until the summit became visible across a broad saddle. 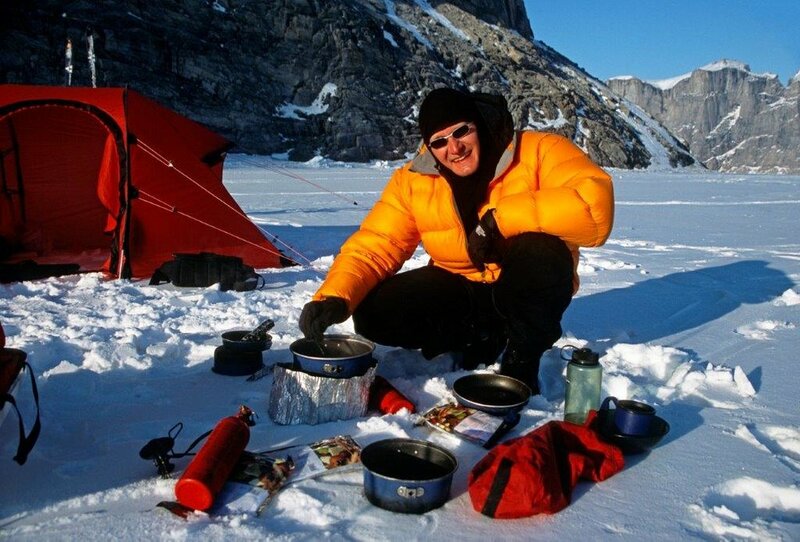 Here we left our packs and continued with crampons and ice axes up the last 600 ft. At the summit, altitude 5,250 ft. (1,600m), we had a splendid 360-degree view, with visibility at least 50 miles into the dark fjords on the north coast of Baffin Island. On Bylot Island itself we could see the whole panorama of snowy peaks and huge glaciers running in all directions. Except to the NE that was covered in cloud, with just a few summits peaking above. This was some of the finest mountain scenery you could imagine, certainly on par with what we saw last year in Pakistan. The summit, we think, has never been climbed before. Dave would check the records with the Alpine Club of Canada. We named the peak Fugoy Fang (Tenzing Fugoy is my Chinese name and since I stepped on the summit first, I claimed the naming rights :-)). Although we had to retrace our steps to some extent we did descend the more direct but steep northern side of the SW spur. The first part on loose rock and then on snow and ice. It appeared doable from above, but when we looked back afterwards it looked vertical and did require total concentration. We returned to our camp at 6pm, a long but rewarding 9-hour day. In our evolving route plan, we had decided to try to cross a pass on the other side of the glacier and descend onto the Sermilik glacier, where we could relatively quickly travel down to the beach to resupply. The pass was a lower altitude than the peak we had summited, but we would have to carry full packs, and the top section looked to be very steep. However, there was no harm in taking a closer look, as we always had the option of going back the way we came. In fact, reaching the top of the pass was quite easy, it took us just over 2 hours. We could follow a rock band on the north side most of the way and only required crampons for a short section at the end. Again, we had fine weather and excellent views from the pass – looking back over our entire climbing route of the previous day, to the east, and the vast ice field of the Sermilik glacier to the west. Of course we had no idea what the descent would be like and this is where the adventure really began. To begin, we spent an hour traversing a steep exposed ice slope. David and I brought leather 4-season boots that can be securely fitted with crampons, but they do not give the ankle support you would get with plastic mountaineering boots, and they make the fit of the boot much tighter. The huge exposure was unsettling, as we were not roped up. 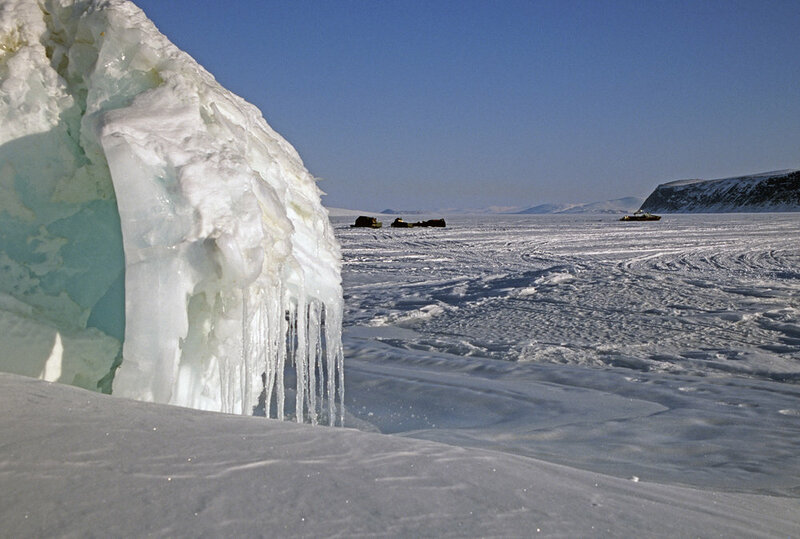 There was no place to rest and it would have been difficult to self-arrest in hard ice had any one of fallen. We did not rope up for that reason. We were rewarded with a lunch stop on a rocky knoll, which was surely one of the finest picnic sites in the world, high above Sermilik glacier. The reminder of the descent looked dauntingly steep. We had little choice except to follow the scree straight down, but this scree was our worst nightmare. The rocks were large and as loose as loose could be and the angle of the slope was near vertical. In negotiating this it was every man for himself – no way for the others to help quickly or at all of required. Of course we had to carry our weighty packs down this slope, which as really far too steep for backpacking. We collected ourselves at the foot of the slope; again we looked back and shook our heads in amazement at the steep slope we had negotiated. Had we been traveling in the opposite direction, there is no way we would have considered an ascent. That was another long day, and it was too ambitious by far to get to the foot of the Sermilik glacier today. 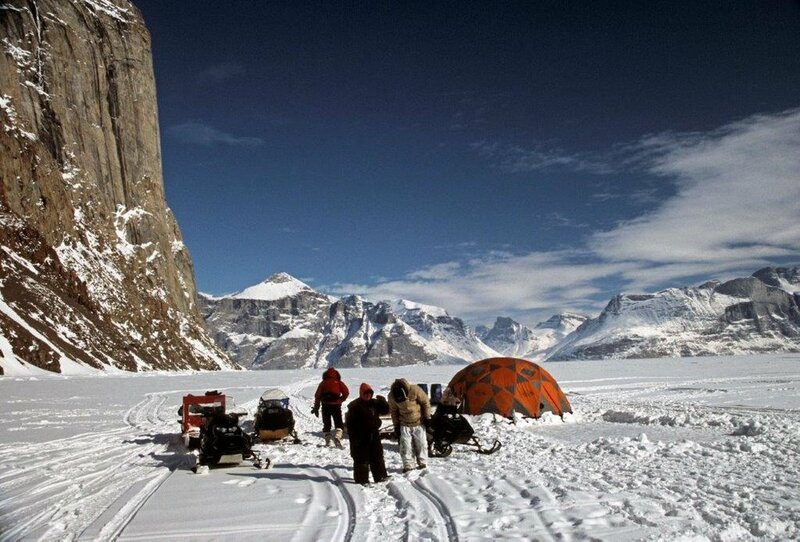 That night we camped in the middle of the Sermilik glacier about 5 miles from the toe. On the fifth day, the plan was to descend on the right (west) side of the glacier, leave our packs at a suitable campsite on the moraine, then skirt along the beach, around the toe of the glacier to pick up the new food supply from the barrels, which we left at the east side of the glacier. At the outset, none of us could have guessed what a ridiculously ambitious plan this would prove to be. We were walking at just over 1 mile an hour with full packs, and the glacier proved to be heavily crevassed on the west side, with plenty of valleys carved out by the glacial streams. It took time and effort to cross these, after which for the first time we came to a river crossing. River crossing is an inevitable and frequent part of Arctic backpacking. We carried TEVA sandals (easy to change into, good footing but no respite from cold water) or neoprene booties (a struggle to put on and off, you can feel every stone underfoot, but they are warm) for the purpose, and edged our way using trekking poles to gauge depth and speed of the water. Changing into/out boots all takes time. So it was not until 4pm that we were ready to leave the campsite to go in search of the food barrels. 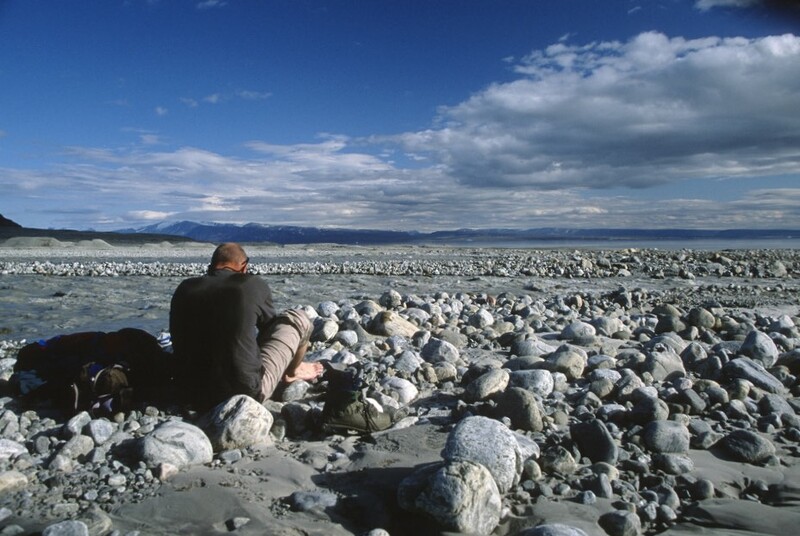 Our journey turned into a nightmare, because we found that the glacial outwash along the beach was braided into numerous deep and cold fast –flowing rivers, and the distance between the toe of the glacier and the open sea – perhaps 200 meters – was insufficient, too much of a gradient to create shallower water where we could safely cross. After the first couple of crossings, we decided to go over the glacier instead, which was easily accessed from the beach. 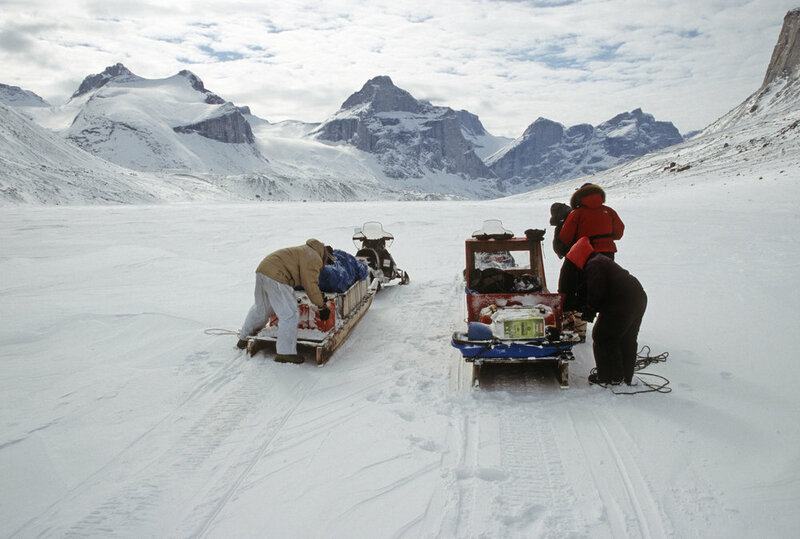 But after an hour of wandering around on the ice, it was apparent that we would need to walk a very long way back in order to safely negotiate the undulating ice valleys and surface glacial streams. So we abandoned that idea and returned to the beach. We tried again to cross the series of rivers emptying from the Semirlik glacier. It was on our fourth river crossing that we nearly fell in (the result of which would be a quick ride to the Arctic Ocean). Instead of walking directly across, we walked halfway across and the up the middle to find a shallower route for the second half. But the current grew stronger and the depth greater until we were mid-thigh in freezing cold water. You could see big blocks of ice floating in the torrent, as the glacier was very near. Although we made it to the other side it was too close for comfort, and we knew it. Dave and I looked at each other and started laughing: we knew it was a lucky escape. The golden rule is that if the water is more than knee deep it is not safe to cross. We had broken that rule. I was hit by one large piece of ice and the force of the water took away one of my booties (we had a spare pair of TEVAS). I was also bleeding but I did not feel a thing due to the cold-numbing water. We started to worry a bit, seeing the glint in Dave’s eyes: he was on a Canute-like mission to reach the barrels and no force of water was going to stop him. So eventually at 7pm David called a halt and asked whether this was a sensible thing to do (this is a British way of saying, "This is completely mad and dangerous, let's stop!!!"). After some discussion we decided to abandon the barrels for that day, take a rest day the following day, and then try again the day after that. We would try very early in the morning as we were expecting the water level to be lower at that time of the day. We had a plan B to do the second half of the trip immediately, with what food we had left, but it was clear that we would be hungry. Added to that we needed some rest. From our position merely half way across the glacier runoff, we returned to the campsite, which was an adventure in itself: a very long way with many ups and downs and difficult crossings of glacial streams. It was the coldest crossing EVER and set a new tolerable level of coldness of me. My legs felt like two wooden pegs. In the evening, when temperatures fall, the surface ice of the glacier starts to harden and it is more difficult to keep the grip, bearing in mind that we had only trekking poles for support and no crampons. We eventually made it to the campsite at 9 pm – an exhausting 12-hour day. After a well-deserved rest day we rose at 5am to make another attempt to retrieve the barrels. It was all in vain. It was quickly obvious that the water was just too fast and to deep to cross safely. It was also so cold at this hour that it was painful to be in it. Our skin turned lobster-red at the slightest immersion. There was nothing to do, but call for help. Fortune was on our side as the ever-helpful Sheatie was at home =, and with the help of another $500 hopped in his boat and helped us transfer the barrels over to the west side of the glacier (his wife was less impressed as we woke her up with our early morning sat phone call). By lunchtime we were restocked, packed and ready to go for the second part of our trip: the planned ascent of Mt. Thule. Once clear of the moraine, we found ourselves in a green and pleasant valley, of rushing rivers and tundra underfoot. We crossed two rivers that presented no problem, and then climbed steeply over the moraine of the Stagnation Glacier – so called because of its dramatic retreat in the recent decades – before we returned to the tundra and found a campsite, on a soft knoll overlooking the vastness of a large glacier on the south side of the valley. 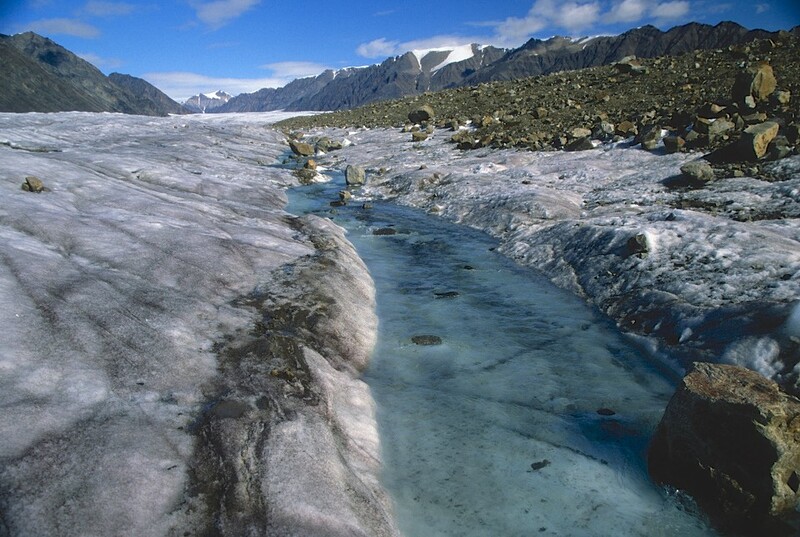 In contrast to the Stagnation Glacier, this glacier barely moved an inch in the same period. The difference is attributed to relative size and the northerly direction of the latter versus the south-facing Stagnation Glacier. Despite our plans we were forced to stay for three nights, as the weather turned and we had continuous rain for 24 hours. It was clear that the ascent of Mt. Thule would be abandoned as all of the tops were clouded in: there is no point going to the top in the rain if there is nothing to see. During that time, the downside of the “3 Men” North Face tent became apparent: it was simply too small for comfort. We were laying head to toe with David in the middle. His feet were between the shoulders of Dave and I. The discomfort and restless nights just added to the difficulty of the trip. We all admitted how tired we were; perhaps it was a good thing that we did not have the conditions to climb Mt. Thule. It would have been another long and demanding day. On the second day, when we could really tolerate not one moment more in the tent, we hiked up directly in front of the huge face of the glacier to the nearest summit, much of it on the tundra and then a long ridge of more loose rock. Dave was absolutely gung-ho to get to the summit and was worth it for the views: you could see far away to the southwest all the way to the coast and beyond to Baffin Island. Monday, August 14 was theoretically our last day, but due to the strong winds, Sheatie could not pick us up. We were starting to worry as we could miss our flight home. We spent the final day walking on the long beach. 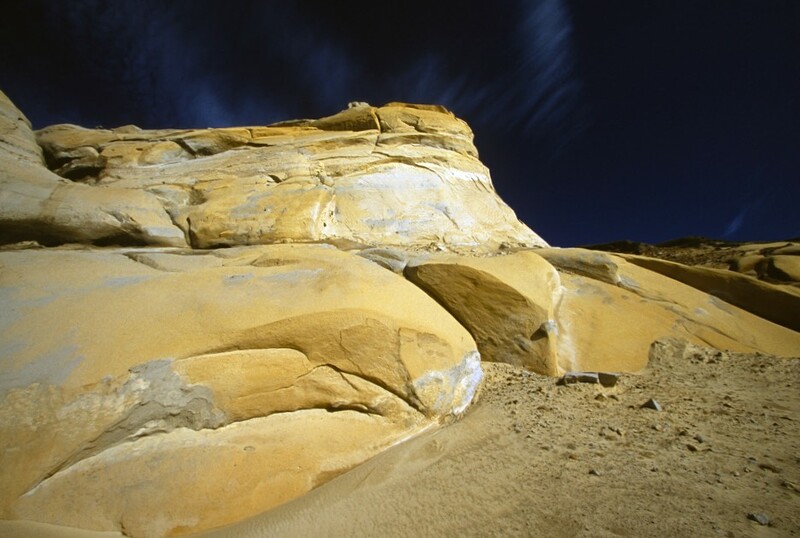 We found big sandstone cliffs with weird shapes – known as “hoodoos – carved out by the wind and rain, perfectly rounded rocks like Moeraki boulders in New Zealand but smaller, and huge boulders inlaid with beautiful patterns like marble. The beach is always a special place, and this was no exception, although noting the presence of bear prints, we were careful to keep our eyes skinned. This area, which is not part of the Park, has been a camping area for the local Inuit for a long time, and was strewn with the bones of seal and narwhal. That evening, a terrific wind blew up and continued blowing all the next day. It was clear there would be no boat pick-up in those conditions. Inside the tent there was respite from the wind, and warmth, but it was incredibly noisy as the wind continuously shook the fabric. We revisited the hoodoos, this time more impressive with blue skies for background and sunshine to accentuate the color, but it was cold and the cold wind sapped our will to spend too much time outside. By evening we were rather worried as there was no let up in the wind and we did have a plane to catch the following day. But at 4.30am there was a sudden flurry of activity as Sheatie was on his way. It turned out that although this did co-incide with a lull in the wind, Dave had been motivated to peek his head out and assess the weather conditions more by his urgent desire to escape the tent. By that point we had spent so many hours in it that any opportunity to get out was not to be missed, no matter how early the hour (as we had 24 hour daylight, hours did not much matter anyway). We waited for an hour on the beach. We tried to find the calmest spot on the beach, the current and wind dragged the anchor and pushed the boat sideways on, so it was a real struggle to push the bow into the waves and get off the island. At this point we were down to the last bits of food, so it was a relief to pick up the barrels again, and raid the emergency supply of soggy digestive biscuits. The ride across the Eclipse Sound was rough with large waves at out comfort limit. We were getting sprayed by the cold water and were totally soaked by the time we arrived in Pond. A quick goodbye with Sheatie and we were off to the local hotel for a plate of eggs and bacon. When we look back on it in years to come, we – and I include Dave, as a fellow traveler not “the leader” - will have fond memories of the expedition. For the fact that we went places and climbed mountains where no one has ever been or climbed before: what a sense of achievement and spirit of exploration in the world were every place has been penetrated. For the excellent company and the temperament of the three of us: we laughed a lot and never argued about anything. For the dangers and risks actual and potential with we faced and overcame. And above all for the privilege of traveling in this wild and remote place. 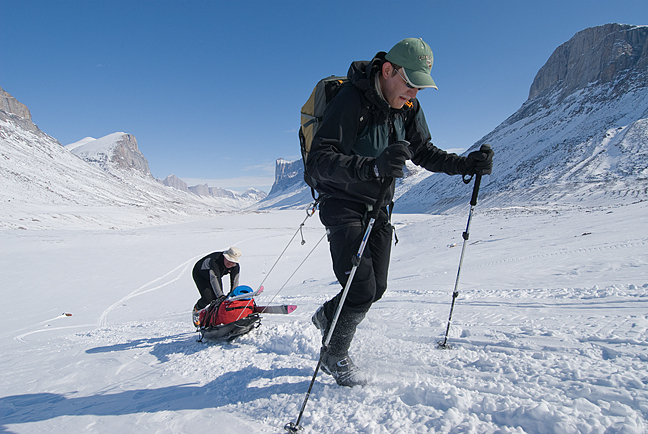 Sermilik National Park is located at the northern end of the Baffin Island and on the Bylot Island amid an expansive landscape of glaciers and mountains rising from iceberg-dotted waters of the Arctic Ocean. Sermilik means the ‘place of glaciers’ in Inuktitut. Vast glaciers flow from an ice cap located in the middle of Bylot Island into nearby Eclipse Sound. Our goal was to climb Mt. Thule and some other unclimbed peaks along the Simirlik Glacier and to explore the Bylot Island's vast glacier system. Our group consisted of David Holberton, David Reed and me. 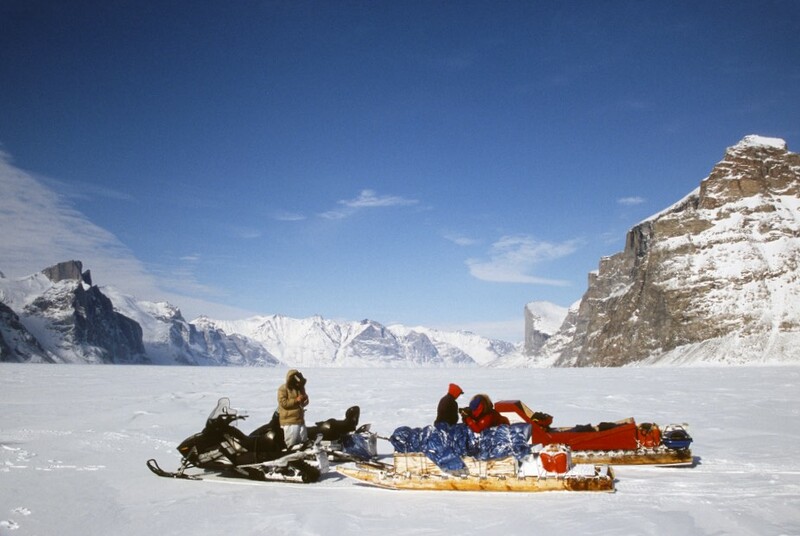 We hired Shaty, and Inuk from Pond Inlet, to take us across the Eclipse Sound. We decided to follow the Sermilik Glacier and climb the highest unnamed mountain on the horizon. We were probably the first people that climbed it. Canadian Army in the North in Pond Inlet. They get a cool looking t-shirt and maybe a gun. We set out to climb the volcano of Incahuasi, a mountain on the border of Argentina and Chile. Incahuasi has a summit elevation of 6,621 metres (21,722 ft) above sea level. We flew from Buenos Aires to La Rioja in Northern Argentina and then drove to Fiambala, the border outpost. There, we met our driver Johnson who arranged for our transport to Las Grutas, a border police post close to Incahuasi. We had two main issues: acclimatization and water. The mountain is very high and there is no drinkable water. We were counting on the winter snowpack to provide us with the source of water. Unfortunately, we did not find any snow and had to abandon our attempt. The trip gave us a great opportunity to trek through the little visited corner of the Atacama Desert. It was a good adventure regardless of our lack of success with the summit. The border post between Argentina and Chile. Since the mountain Incahuasi is on the border, we need to clear the customs. We will be in no man's land.